00:01 BobB hi mtj about? 03:20 jcamins @later tell paul_p How is the weather in Marseille in November? 03:20 huginn jcamins: The operation succeeded. 03:20 huginn eythian: The current temperature in Marseille, France is 14.0°C (5:00 AM CEST on October 08, 2015). Conditions: Clear. Humidity: 72%. Dew Point: 9.0°C. Pressure: 29.92 in 1013 hPa (Steady). 03:21 huginn jcamins: The current temperature in Cedar Grove Cemetery, Flushing, New York, New York is 16.0°C (11:06 PM EDT on October 07, 2015). Conditions: Clear. Humidity: 73%. Dew Point: 11.0°C. Pressure: 30.03 in 1017 hPa (Rising). 03:21 jcamins eythian: what I'm really concerned about, actually, is snow. I hate snow. 03:22 jcamins And sun. Cold and sunny I like. 03:22 jcamins Cold and dreary, no. 03:24 jcamins It's also the beginning of October right now. 03:41 eythian ^-- I misread that variable each time I see it. 03:47 eythian gah, and I just spent ages staring at something to see why it wasn't working. Turns out it was working just fine, I hadn't noticed. 04:58 Pete__ Hello? Anyone out there? 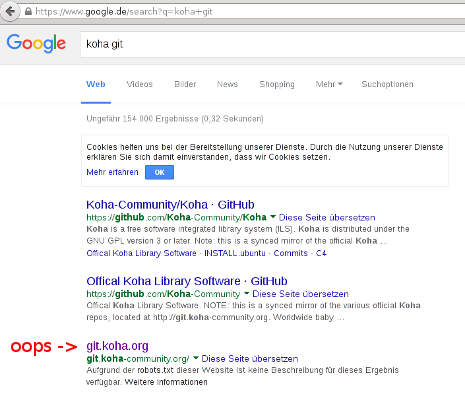 I'm looking for some Koha help... is this the right place? 04:58 eythian though, you're on a slightly odd timezone border so it's quiet about now. 04:59 eythian I think the US is asleep, NZ is about to go home, and europe is about to wake up. 04:59 Pete__ Haha, I'm in Chicago -- do you have time for a quick question? 05:00 Pete__ Is there by chance some "amazon lookup" thing where I don't have to enter in information about every single book? This school is just getting started from scratch. 05:00 Pete__ I must be missing something... right? 05:01 eythian you can enter the ISBN and look it up in a bunch of libraries, e.g. library of congress. 05:05 Pete__ Awesome. This is a small school library here but I'd still rather not ask them to enter in all the info manually. I'm sure we'll have to for at least a few things but the more I can automate the better. I'll check this out. Thanks guys. 05:06 eythian you should be able to get it to the point of barcode scanning the ISBN, loading the record, tweaking a few things, and saving. 05:06 eythian 1-2 minutes per book rather than about half an hour each to catalogue it from scratch. 05:06 Pete__ Yes! That's what I'm shooting for. This Zebra thing is the answer to that, yes? 05:06 wahanui i heard Z39.50 was the ANSI standard of the beast. 05:07 Pete__ awesome. Off I go. I'll return here at a more reasonable time next time! Have a good day / night / etc! 05:07 eythian later, good luck! 09:17 mtj but, just a thought..
12:00 jcamins Joubu: you live in Marseille too, right? How's the weather? 12:04 drojf jcamins: going to marseille? 12:05 jcamins drojf: considering a vacation, and Marseille seemed to have affordable flights. 12:05 jcamins So did Oslo, so when magnuse is around, I'm going to ask him how crazy Oslo is as a vacation destination in November. 12:09 jcamins drojf: I'm not a huge fan of snow and dark, so Oslo seems like it might be a poor choice... on the other hand, maybe Oslo is especially beautiful in November. 12:11 jcamins liw: yeah, that I know. The question is whether there are enough advantages to Oslo in November. 12:57 jcamins Joubu: I'm thinking about a vacation for November, actually. 13:04 drojf do we know who uses plack in production already? 13:05 drojf dpavlin's library probably. some biblibre libraries too maybe? 13:06 drojf tcohen: are you running plack in production? 13:07 tcohen drojf: did you give kohadevbox/ansible a chance? 13:17 ashimema burrently we're hvin some teething issues with db connections going away..
13:17 ashimema but i'm struggling to narrow them down enough to make head nor tails of it. 13:19 drojf are there other koha benchmarking things than what is in load_testing st the moment? 13:19 ashimema Joubu.. would it be a good idea to get ribasushi to give that patch a once over..
13:20 ashimema I still havn't managed to pin down the actual issue.. he thought/we thought there was somtihng wrong in dbic itself that meant our usage was loosing connections..
13:32 schnydszch Hello all! If I update the marcxml in biblioitems, are there any repercussions? I see that there's a marc column and marcxml columns. 13:40 huginn drojf: The operation succeeded. 14:46 drojf oh, we had a meeting yesterday? 14:47 drojf or, did not have, but were supposed to? 16:31 nitz0 Is there another way than editing Sendmail.pm to configure smntp service? 18:12 Kchris wnickc: gitifying koha on a kohabox--is this pretty straightforward? 18:15 Kchris I finally got the languages to install on kohadevbox (with help from Magnus), but I haven't yet managed to "activate" the languages within the administrator web interface. 18:16 Kchris Only English shows up in the preferences--the other languages I have installed don't. 20:05 wizzyrea drojf: I think gmcharlt may have to fix that, or someone at bywater, that's not a web property I have much to do with. 20:05 gmcharlt wizzyrea: what's the antecedent? 20:05 wizzyrea drojf: "i just found that the page title displayed by google for git.koha-community.org is "git.koha.org". can that be changed maybe? http://abunchofthings.net/koha/pics/git_title.png"
20:12 wizzyrea probably do need to allow them to index the home page? 20:43 kchris wizzrea: what does ++ after a nickname mean? is it like a compliment? 20:45 huginn wizzyrea: Karma for "gmcharlt" has been increased 164 times and decreased 0 times for a total karma of 164. 20:45 huginn gmcharlt: Karma for "cthulhu" has been increased 0 times and decreased 1 time for a total karma of -1. 20:45 huginn wizzyrea: cthulu has neutral karma. 20:46 huginn wizzyrea: Karma for "IE" has been increased 1 time and decreased 27 times for a total karma of -26. 20:46 wizzyrea well, we do -- pretty often... on IE. 20:47 wizzyrea yes, exactly. and it is also deserving of ire. 20:47 kchris wizzyrea++ thanks for the explanation. 20:47 wizzyrea but yes, good point we don't normally decrement people. 20:48 huginn wizzyrea: Karma for "wizzyrea" has been increased 65 times and decreased 0 times for a total karma of 65. 20:48 huginn kchris: Karma for "kchris" has been increased 1 time and decreased 0 times for a total karma of 1. 20:49 huginn liw: Karma for "liw" has been increased 11 times and decreased 0 times for a total karma of 11. 20:50 wizzyrea one of the things I particularly like about working with Koha, is that whenever I use a part of it, I can reasonably say that I know the person who made it. 21:26 grharry I seem to get a problem after running update_bin/devel/dbix_class_files.pl /usr/share/koha/lib/Koha/Schema/Result/Reserve.pm file is Different than the Original ... Anybody with An IDEA ??? 23:08 wahanui Sod it all, let's head to the pub!